Our new AGT800 Laser Thickness Gauge was selected as a top five finalist in American Metal Market’s fifth annual Awards for Steel Excellence. The nomination was in the Best Innovation Product category. 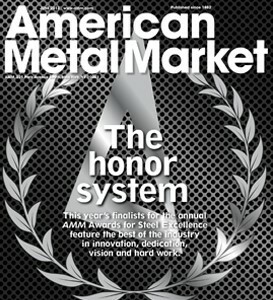 Even though we did not receive the award, which was presented in New York on June 17th to New Star Metals Material Science Corp, we were still very excited to be a part of such a prestigious group that also included Herr-Voss Stamco, Leveltek International, and MMFX Steel Corp. of America. It was indeed an honor just to be included as a finalist, which in itself is a testament to the contributions made by everyone at A.G.T. to bring this revolutionary new product to market. The AGT800 uses advanced Keyence Laser Sensors and is capable of measuring material ranging from .001 to .750” (25µm to 19 mm.) in thickness, depending on the sensors selected. There are also options available for measuring thinner gauge material as well. There is no radioactive source and no federal or state licensing requirements. It is alloy insensitive and can measure any type of material in strip, coil or sheet form. Direct benefits include documented compliance with ISO9002 and QS9000, in addition to improved process control, increased productivity, and scrap reduction. The AGT800 incorporates a similar user interface and has most of the same functionality and easy to use operating features as our market leading AGT400 Isotope Thickness Gauge. There are no special cooling or installation requirements. It is also supported by A.G.T.’s highly trained and experienced team of Field Technicians with over 50 years of combined experience. For detailed specifications or to request a budgetary quote, please contact our Sales Department at (614) 873-6691 or Sales@AdvGauging.com.